Go into any classroom and you'll find reluctant writers. Some will tell you writing is boring. Others will say it's too hard. Some students are afraid to begin because they don't know if their idea is good enough. 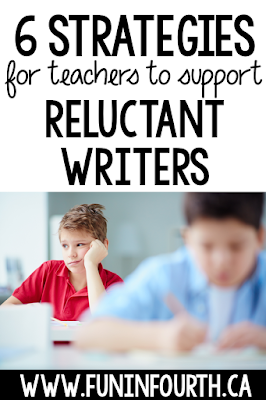 So, how do we engage these reluctant writers? 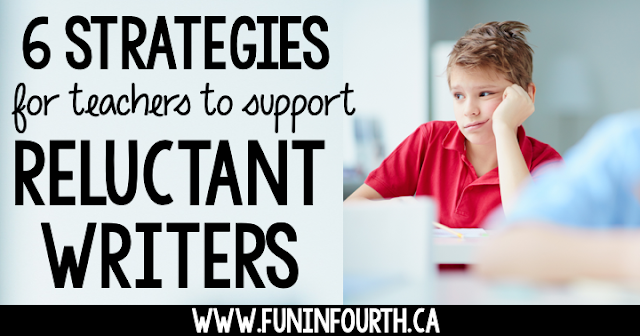 These 6 strategies will be sure to help you find success with any reluctant writer. One of the reasons students can struggle with writing is because they don't know WHAT to write. Whenever we start a writing task, I have my students share their thoughts as a whole class and also with a shoulder partner. The benefits of the whole-class talk is that it can be less daunting for some. 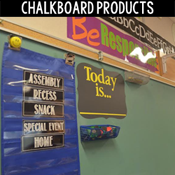 It also provides a wide variety of learners to share their thoughts letting your reluctant kiddos hear more ideas. Sharing with a shoulder partner can be beneficial too because letting only one person hear what you're thinking can be safer. Also, students can carry on a short conversation, letting the ideas go a little deeper. I often find that students with limited writing output can be excellent artists. Giving them some time (it doesn't need to be more than 5-10 minutes) to draw out their thinking allows them to get the creative juices flowing. 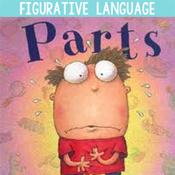 Check in with your reluctant writers and help to provide some vocabulary for their image. You can leave them with a sticky note of thoughts from your conversation to get them going. Additionally, you can have your class get up and do a gallery walk to view all the drawings in the room. 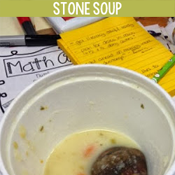 This prompts learners to have even more ideas! I like to give them another few minutes to add to their drawing in pen. This allows me to see what new info was added as information from others. There's a lot of power in the tried and true graphic organizer. Getting some of the work "out of the way" helps reluctant writers to feel successful right away. Webs, Venn diagrams, t-charts, and 5 finger planners are all options depending on the writing task. Giving students the time to process their thinking through any of the top 3 strategies can be very rewarding. In my experience those who are reluctant often feel overwhelmed at the start of the task, no matter how big or small it actually is. Checking in with them, and writing a few sentences (their own words from your conversation, of course!) can boost their confidence and attitude right away. Sentence starters can also be really powerful as well. That being said, there is a time and place for the use of technology. I caution it's overuse as students do need still need the skill of writing with pencil and paper. Sometimes the issue can be that students are afraid of the assessment. As much as we love to grade, it can be really powerful to turn the reigns over to the students. 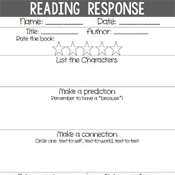 Ask students self-assess or to to analyze each other's work in small groups. Through these activities, students will see that they don't just write for a grade, they write to strengthen their ability and think more clearly about a topic. There really is no need to assess EVERY piece of writing, especially if you do a weekly journal write. Let students know when pieces will be assessed (and how - with clear criteria!) and when they won't. Need some more writing inspiration? Check out my Pinterest board.